A two-and-a-half hour bus ride from Cancun takes you away from the thumping parties of spring break and into the once thriving ancient capital of the Yucatán Maya, Chich’en Itza. During the spring and autumn equinoxes, thousands of tourists and locals pack in around the pyramid to recreate the parties of a thousand years ago—sans the cutting out of hearts—and to watch the “descent of Kukulcan.” A carnival atmosphere fills the surrounding meadow with sounds of drums, traditional music, and cheering crowds. 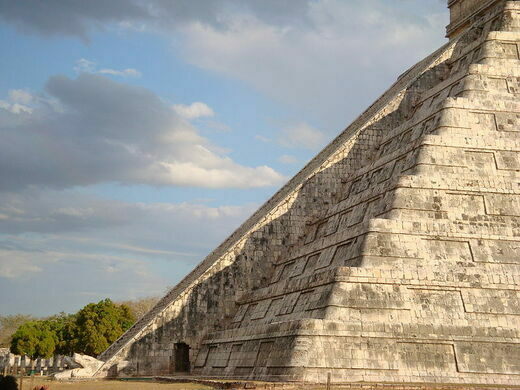 According to legend, twice a year when the day and night are in balance, this pyramid dedicated to Kukulcan (or Quetzalcoatl), the feathered serpent god, is visited by its namesake. On the equinox, Kukulcan returns to earth to commune with his worshipers, provide blessing for a full harvest and good health before entering the sacred water, bathing in it, and continuing through it on his way to the underworld. A handclap near the base of the pyramidal results in an unusual chirping echo, which is said to replicate the call of the sacred quetzal bird. All legends aside, crafty and mathematically brilliant architecture combined with the natural rotation of the Earth creates an amazing and somewhat eerie image of a giant snake crawling down the temple. For five hours an illusion of light and shadow creates seven triangles on the side of the staircase starting at the top and inching its way down until it connects the top platform with the giant stone head of the feathered serpent at the bottom. For 45 minutes this impressive shadow stays in its entirety before slowing descending the pyramid and disappearing along with the crowd that gathered to see it. 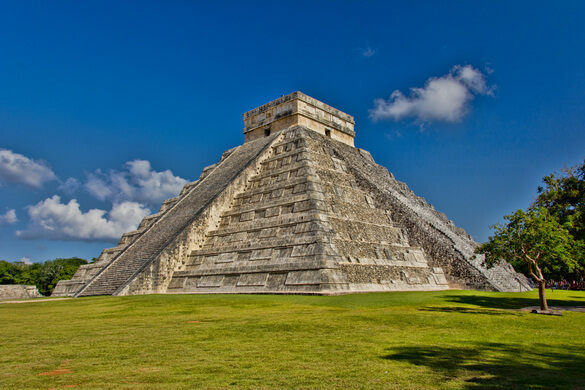 The Pyramid of Kukulcan or Kukulkan (also known as El Castillo, a name given by the Spanish Conquistadors) is the centre of Chich’en Itza, it was built over a preexisting temple between 800 and 900 CE. It is the biggest pyramid in Chich’en Itza; at its base 53.3 meters wide on all four sides. It towers above the other monuments at 24 meters tall with a 6-meter temple on top of the highest platform. Before access to the throne room of the pyramid was restricted, you could climb to the top and, on a clear day, see the top of the grand pyramid at the nearby ruin site of Ek Balam. The Mesoamerican fascination with, and knowledge of, math and astronomy shines when examining the details of its architecture. Each of the four sides has 91 steps ascending it, 364 steps total, with the temple topping the pyramid considered an addition step totalling 365, each step representing a day in the calendar. Additionally, the pyramid’s nine stages, bisected by a staircase on each side, represent the eighteen months of the Maya Calendar year. The pyramid was built to be a physical representation of the Maya Calendar (the same calendar that predicts the end of the world in 2012), while its orientation, slightly North East, is believed to have been calculated in order to create the phenomenon know as the “Descent of Kukulcan”. This phenomenon is recreated nightly (artificially) during the Light and Sounds Show at 7 p.m. in winter and 8 p.m. in summer. Chich’en Itza is one of the New Seven Wonders of the World and a UNESCO World Heritage Site. The archaeological site features various structures that are grouped into major clusters. 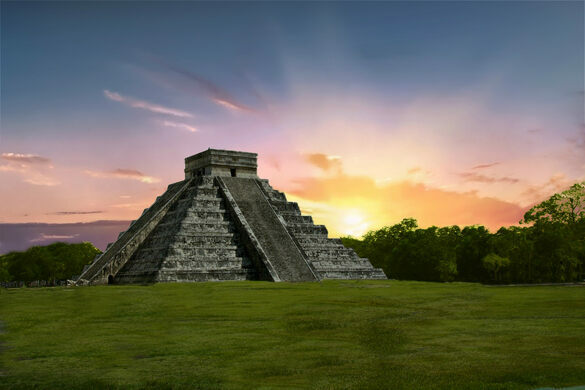 The most famous and visited cluster is the Great North Platform where besides the Kukulcan Pyramid one can find the Temple of the Jaguars and the Great Ball Court. From Cancun it is very easy to get a tourist bus to Chich'en Itza. Or drive west on Hwy 180. Ask your hotel for more specific directions due to constant change in Mexican roads and lack of detailed information available online. From Merida drive 74 miles East on Hwy 180.